More rubbish from Pringle’s unanchored boat. Mate. You need to get a life. “Why do you look at the speck of sawdust in your brother’s eye and pay no attention to the plank in your own eye?” (Luke 6:41). Stay on your lane brother, go and win some souls for Jesus, make a real and positive difference in the life of someone. Anyone who defends Phil also, by extension, defends his theology. Sadly, Phil’s “theology” has been comprehensively exposed as a confused hodge-podge of heresy and new age / occult teachings, and his so-called “gospel” is nothing of the sort. Phil Pringle does not have a speck of sawdust in his eye; he’s got a stockpile of timber that would shame a sawmill. So instead of worrying about others, and whether or not they have a life, you should instead worry about yourself – because it’s clear that what you need is to get a brain. Jorge I have been living in Vietnam as a SELF FUNDED for over 6 years. ( i HAVE BEEN A CHRISTIAN AS LONG AS PRINGLE AND HAVE NEVER ONCE PIMPED AND MANIPULATED TO RAISE SUPPORT)-sure I could take photos of orphans here in Vietnam, without arms or legs and work on the emotions of christians I know from the past few decades. However pigs will fly before I stoop that low! BTw It takes a lot of patience and faith to live in a third world communist country. Don’t worry I have a life and am winning souls for Jesus. 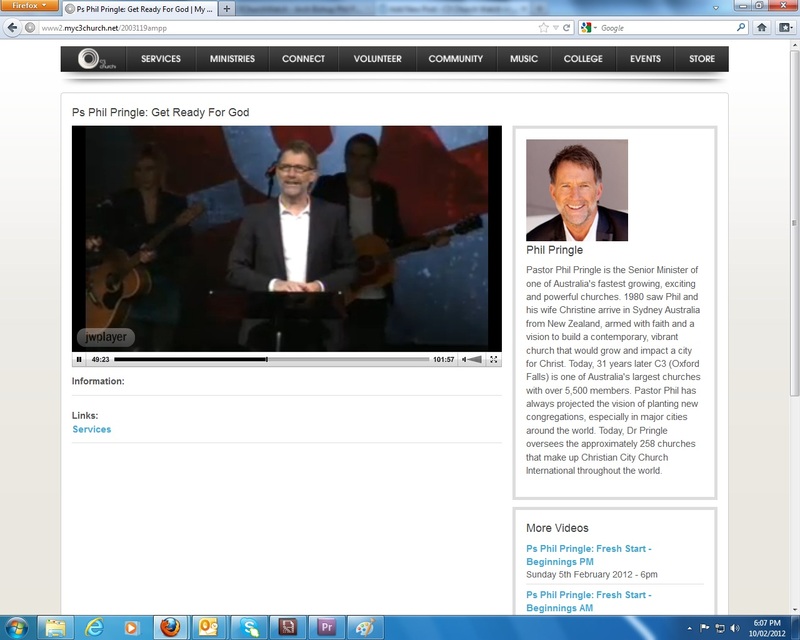 I was witnessing and bring souls to church at AOG Sydneham before Pringle was saved. I haven’t given a rats what he has been doing since he split up that church and stole half the sheep. Basically I don’t give a rats what he does now but since I met Jake online I believe in his cause as being a just one to warn people of Pringle’s deception. Basically we don’t have to find specks of sawdust. Pringle dribbles out so much rubbish that he exposes his own lunacy. C3churchwatch researches and exposes this lunacy and posters like myself comment on it. Unlike you I give my real name and not only that I am a tangible person that Pringle has actually physically met.In fact up until the time Pringle split our church I took him and the Tyndalls out on the streets witnessing. Don’t talk to me about soul winning -the first few years I was saved I witnessed to nearly every person-child, teenager, old person, etc that I met on the streets and personally gave out over 100,000 tracts during that time and the next few years. That’s what this site is about. Please read that scripture in context before bashing people over the head with it. If you want to look biblically sound, I can delete the above comment and you can rewrite it. 41“Why do you look at the speck of sawdust in your brother’s eye and pay no attention to the plank in your own eye? 42How can you say to your brother, ‘Brother, let me take the speck out of your eye,’ when you yourself fail to see the plank in your own eye? You hypocrite, first take the plank out of your eye, and then you will see clearly to remove the speck from your brother’s eye.